Hello people of the internet!!! On today’s ‘Monday Memos’ we’re going to review a really cool anthology which was provided by Candlewick Press, and was released on September 1, 2016. This book features authors from/living in New Zealand & Australia, & as the name suggests, consists of short essays that explain what book had a profound affect on the author’s writing and/or life. As always this review will be spoiler free & completely honest, also this is the 1st time we’re reviewing a non-fiction book so let’s see how it went. Ready? Ok, let’s go! Usually I would give a quick plot summary here but we can’t really do that this time because the whole book is essays following a similar theme so we’re going to skip straight to the review. Personally I knew that I would enjoy this book because I’m a giant book nerd & this collection is about other giant book nerds talking about books however, I also know that this book won’t necessarily be for everyone. In this anthology you’ll find stories about author’s who recount how a book changed their perception of themselves or where they came from, inspired them to become an author through the book’s ability to entrance them, or inspired them to become an author because they didn’t like the book in question. If you think that this is the sort of anthology you’d enjoy reading then this collection has some really interesting stories for you. Now you’re probably wondering what I thought. Well although I did enjoy this book, I honestly had to give it a 3 out of 5 smiley faces because some of the stories were more interesting than others. I’m glad that I read this book, but because of the fact that every story isn’t totally gripping I can’t really give it a higher rating. All photos and information in this blog post belong to Candlewick Press, Ambelin Kwaymullina, Mal Peet, Shaun Tan, Markus Zusak, Randa Abdel-Fattah, Alison Croggon, Ursula Dubosarsky, Simon French, Jaclyn Moriarty, all of the other authors who contributed to this book, and all companies, individuals, corporations, managers, writers, producers, authors, publishers, and/or businesses that should receive credit for any book(s), mentioned in this blog post, all of the and all companies, individuals, corporations, managers, writers, producers, and/or businesses that should receive credit for anything mentioned in this blog post, and all original owners. I do not own anything in this blog. If any people, corporations, businesses, companies, etc, were not previously given credit for their work, they are given credit now and their previous absence was unintentional. All opinions expressed in this blog are my own. I wrote this blog for entertainment purposes and no copyright infringement is intended. 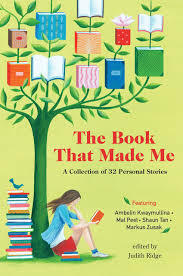 celindareyesblog January 15, 2019 No Comments on Monday Memos: Book Review of ‘The Book That Made Me’ anthology. Category: Book Reviews. Tagged: author, book, essay, fun, new, non-fiction, novel, short story, the book that made me, YA, young adult.